Performing a root canal treatment for the purpose of retaining a tooth in the mouth after its nerve has died or an abscess has developed, a root canal is a last resort. In fact a tooth is the only organ or tissue in the body that is not “amputated” when it dies. Some reports suspect a relationship between the appearance of certain chronic diseases and root canals. 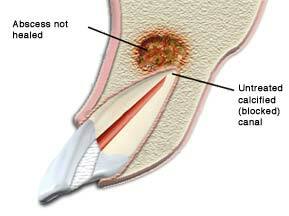 Conversely, there are reports that some of these diseases improve after the root canalled teeth are removed. Dr. Sarkissian’s blog shows a series of illustrations of a root canal treatment, when it becomes necessary and how it is properly performed. The length of time the tooth has been dead without being root canalled. The strategic importance of the tooth. The presence of a serious chronic degenerative or autoimmune disease, unexplained neuralgic pains, heart disorder, or lowered immune system. Our blog article about the root canal procedure, its risk, disinfection methods and materials will give you a deeper understanding of the subject. A root canal is, as mentioned above, only the last resort. Dr. Sarkissian’s method of choice to avoid a root canal treatment is the Laser Direct Cap procedure.